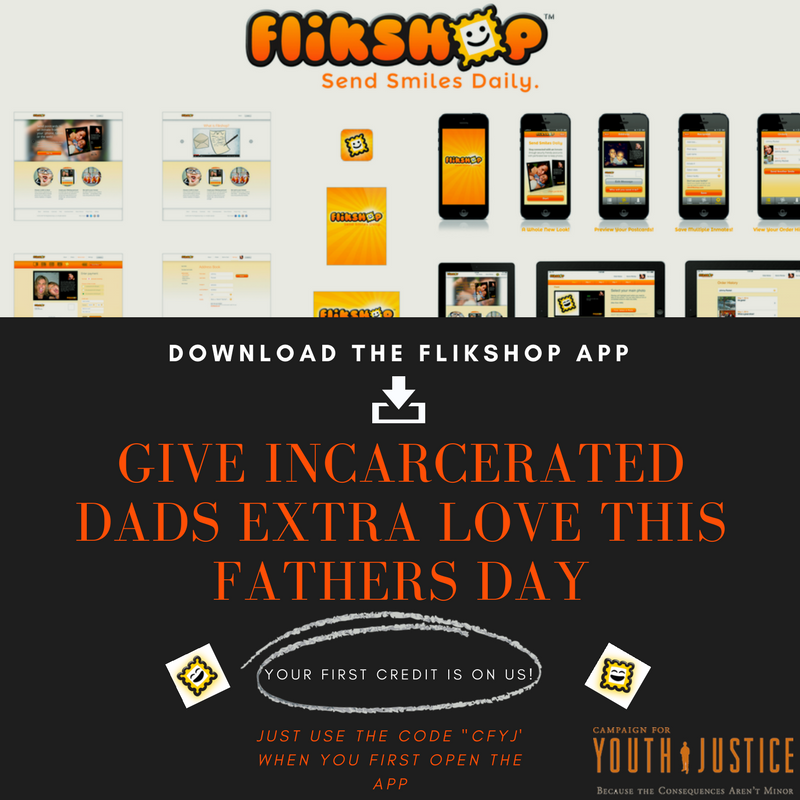 WASHINGTON (June 15, 2017) -- The Campaign for Youth Justice (CFYJ) has partnered with Flikshop, a mobile app that connects families with their incarcerated loved ones via personalized postcards. The two organizations have joined forces to help incarcerated fathers receive mail from their children this Father's Day season. "Being a father has been the greatest blessing of my life, so I couldn't imagine what the fathers in prison are going through with not being able to see their children," says Marcus Bullock, CEO of Flikshop. “Most of the teens in my classroom at New Beginnings [Youth Detention Facility in Maryland] can tell you a story of how they once wrote a letter to their dad that was locked up. The first thing I tell them is that I’ve been locked up and my father was locked up when I was younger too. I am happy that we can work with the Campaign for Youth Justice to get Flikshop in the hands of more people to help connect fathers and children this Father's Day." The partnership enables CFYJ to give away Flikshop credits to families across the country that have an incarcerated father. CFYJ sponsors the credit, allowing families who download the mobile app to send a postcard for free. Research shows that 2.7 million children, around half of who are under ten, have a parent in jail or prison. Experts are recognizing this data as an“adverse childhood experience”which can increase the likelihood of health and social problems as an adult. Flikshop helps reduces the isolation that a family feels from their loved one while they are in prison. During this special time of year for fathers, a simple Flikshop credit can give children the chance to join in with their peers in celebrating, sending any father in any correctional facility a Flikshop postcard. "The Campaign is happy work on this worthwhile initiative with Flikshop. Being incarcerated can be very lonely and since every father and child cannot be together on Father's Day, we want to do what we can to help foster some type of connection, "said Marcy Mistett CFYJ CEO. “We thank Flikshop for offering this opportunity and we are hoping that it will be fully taken advantage of to show incarcerated men that they are being missed and being thought of." Information on how to download the Flikshop App can be found here. Please use the code "CFYJ" to access free credits. The Campaign for Youth Justice (CFYJ) is a national initiative focused entirely on ending the practice of prosecuting, sentencing, and incarcerating youth under the age of 18 in the adult criminal justice system. For additional information, visit www.cfyj.org.